Hack Harassment wasn’t an isolated incident: Intel Corp.’s initiative against online bullying was part of a $300 million effort started last year to make the world of tech a friendlier one – beginning with its own U.S. workforce, which it pledged would “reach full representation of women and underrepresented minorities” by 2020. And in many ways the first year of the company’s initiative was a successful one, with Intel exceeding its goal of 40 per cent diversity among new employees by increasing the number of women hired by nearly 43 per cent, and the number of underrepresented minorities (that is, non-Asians) hired by 31 per cent, according to the company’s 2015 diversity and inclusion annual report released on Feb. 3. 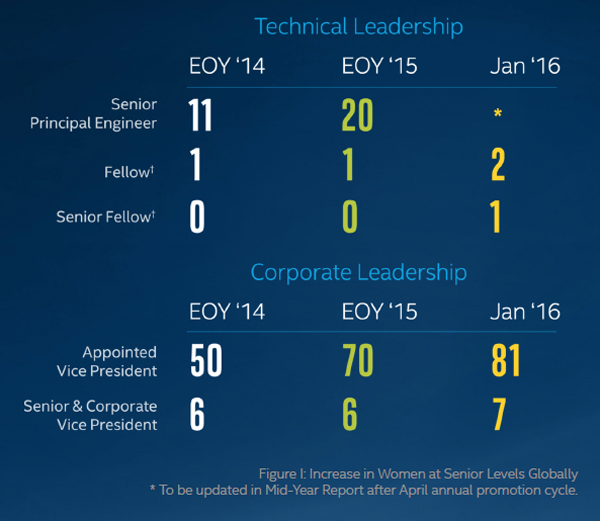 But underneath each gain lies a more sobering reality: the 43 per cent increase in the number of women hired means that women represented 35 per cent of Intel’s new employees in 2015; the 31 per cent increase in hiring underrepresented minorities means they represented 11.8 per cent of Intel’s new employees in 2015; and the company’s overall U.S. workforce remains 53.3 per cent white (and 32.8 per cent Asian) and 75.2 per cent male. A commitment to transparency by publishing its results every year. “It keeps us accountable and we hope it encourages others to be equally transparent,” the report says. A compensation analysis that examined gender pay parity for U.S. employees across job types and levels, and which resulted in the company reporting 100 per cent gender pay parity. Launching the Global Accelerated Women’s Leadership Program, which provides women in mid-level management positions with the assistance they need to secure a more senior role, including leadership assessments, career strategy development, and opportunities to meet with VPs and other Intel executives. More than 200 women have completed the program, and among these participants, the promotion rate of women from middle to senior levels has doubled (below) – though the overall numbers still appear to be quite low. 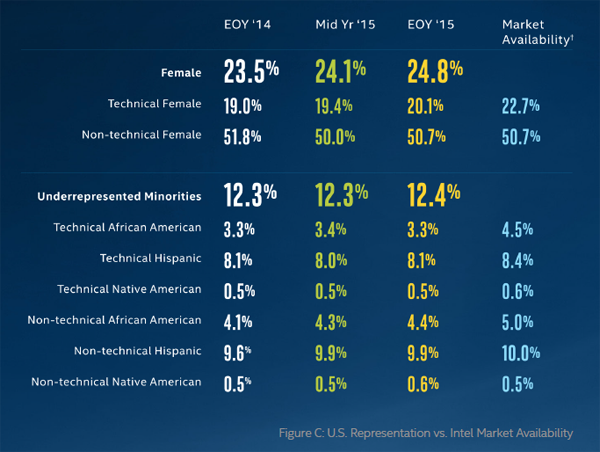 To be fair to Intel, there are many entrenched reasons for the tech industry’s lack of diversity, and they cannot be changed overnight, a fact the company acknowledges in the report by focusing on where its efforts missed the mark. 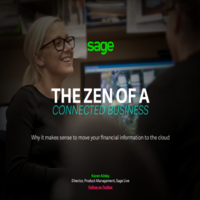 “While we’re gratified that our pioneering efforts have shaken up the company – and the industry at large – we’re focused on the progress that remains,” the report said. In particular, the company admitted to falling short of its hiring goals for underrepresented minorities, and its retention rate for African-Americans. For 2016, it has committed to 45 per cent of new hires in the U.S. being from diverse backgrounds, with a sub-goal of 14 per cent being underrepresented minorities.